What Causes Lump to Appear in Your Palm? Can You Get a Pimple on Your Lip? A bump or lump can be classified as any type of enlargement or abnormal bulge under or above the skin. Lumps on the neck are quite common. A lump found on the back of the neck can be formed due to a muscle injury, inflamed tonsils or swelling of the lymph nodes. 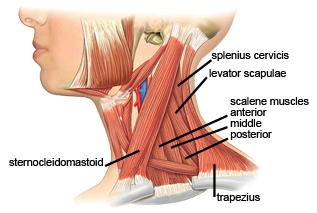 This can cause a great deal of pain and stiffness in the neck. However, sometimes these lumps can go unnoticed and do not hinder the quality of life of a person. A damaged tendon or muscle can be the main culprit behind the swollen bump on the back of the neck. Muscles and tendons keep the body in shape and when one is injured or pulled, the muscle moves from its original position. The damaged part of the muscle sticks out, which forms the lump. Symptoms of a torn or injured muscle are usually difficult in moving the head, neck stiffness and sharp pain. The main causes of an injury to the muscles or tendon can be a car accident or strenuous exercise without the proper equipment or training. 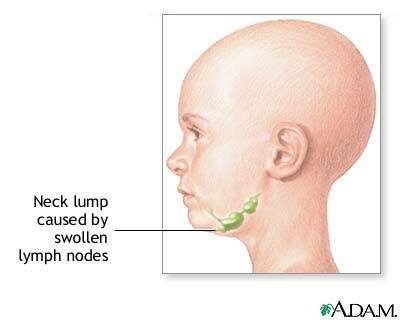 A swollen lymph node is another cause of lumps in the neck. The lymphatic system is made up of many tiny vessels that contain fluid called lymph. 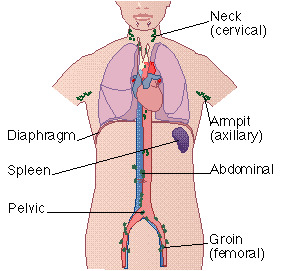 These vessels circulate lymph throughout the body and help protect the body against infections. The lymph nodes are made up of lymphatic tissue and are found throughout the body, mainly in the neck and the underarm. 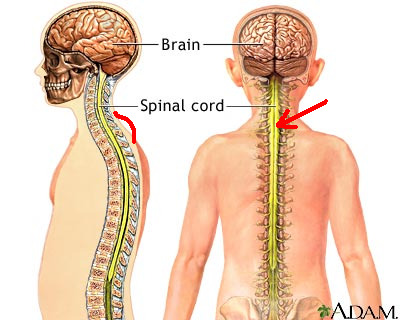 The lymph nodes clear the lymph fluid as it moves through them, filtering any bacteria in the fluid. The waste is stored in these lymph nodes and destroyed by the white blood cells. If there is too much bacteria in the lymph nodes, an infection can occur which will cause the lymph nodes to swell. These lumps can be extremely painful and can cause difficulty in swallowing. It can also cause discomfort in the neck, which prevents the person from moving their neck easily. Sore throats and the common cold can cause swollen lymph nodes in the neck. A type of fever called glandular fever is an infection that causes the lymph nodes to swell at the sides or the back of the neck. Swollen lymph nodes have a cause, which must be diagnosed before adequate treatment can be given. Bacterial infections can be treated with antibiotics. For viral infections, there is no medication that can be used to treat the swollen lymph nodes and symptoms usually wear off in a week's time. As with any infection, rest and fluids are necessary to help relieve the pain and help the body recuperate. 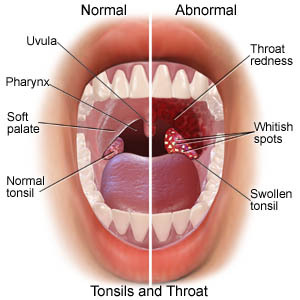 Tonsillitis is an inflammation of the tonsils located at the back of the throat. The tonsil is a ball shaped structure situated at the back of the throat, hanging just above the end of the tongue. The tonsils play an important role in safeguarding the body as it catches any harmful bacteria that attempt to enter the body through the throat. When the tonsils are infected because of an overload of bacteria, inflammation occurs. A lump forms at the front of the neck, and if the infection progresses, the lymph nodes located at the back of the neck are at risk for possible infection and inflammation as well. The major symptoms of tonsillitis are trouble swallowing, fever, and pain. For mild cases of tonsillitis, gargling salt water is a great way to relieve pain and cleanse the tonsils. If the tonsillitis infection becomes severe, you must visit your doctor to receive antibiotics and prescription medication. Sometimes the doctor might recommend that the tonsils be removed through surgical means. Lymphoma is a form of cancer that occurs in the lymphatic system. The white blood cells found in the lymph fluid that circulates throughout the lymphatic system begin to multiply abnormally. These cells are considered cancerous. They will ultimately collect in a lymph node and form a tumor. These tumors can be felt through the skin and sometimes even seen as an emerging bulge. If the lymph nodes in the neck have been infected, the patient will be able to feel a hard mass right at the back of the neck. Lymphoma lumps appear almost immediately and do not cause any pain. As with most types of cancer, the treatment for lymphoma will involve chemotherapy. This form of therapy uses drugs, which move through the body and kill cancer cells. Radiation therapy is also used, where x-rays are targeted towards the specific tumor site and kills the cancerous growth in hopes of stopping it from spreading to other parts of the body. If possible, surgery can also be performed to remove the cancerous lymph nodes from the body. A neck boil is an infection in the neck that will appear usually in the middle of the neck area. Neck boils are infected areas full of bacteria. There are many causes of neck boils. Poor hygiene and previous health issues are the main causes. Diabetes can also cause neck boils. When an area gets irritated, due to any damage to the skin or from clotting, it gets infected and causes boils. The area where the boil is will be swollen and red. The boil itself is hard and may look like a red bump in the beginning. It is painful to touch and feels soft. As the infected boil enlarges, it may begin to fill with pus which can be visible and the boil changes color to a pale yellow. The pain will increase and more boils may begin to appear. Fever and swelling of the lymph nodes in the neck are also possible symptoms. Simple neck boils will relieve themselves and usually go away without any treatment. However, because the cause of boils can be diversified, it is important that you see your medical provider. If the culprit is bacteria, the boil will have to be drained and antibiotics administered. Sometimes surgical treatment may be advised. Most importantly, do not touch the boil or try to pop it on your own. This will only irritate the boil further. Keep the area clean and apply a warm compress to alleviate pain. Taking care of your body in general will help prevent the recurrence of neck boils. Personal hygiene is of uttermost importance in the prevention and treatment of neck boils.